I’ve written quite a few posts about my June trip to northwestern Oklahoma. Four days at the ruggedly scenic Four Canyon Preserve and nearby Packsaddle Wildlife Management Area yielded a few interesting jewel beetles (though not many tiger beetles), but the followed two days in the red clay/gypsum hills just north of there were as successful a two-day period as I’ve ever had, with new localities for Cylindera celeripes (swift tiger beetle) and true field photographs of Dromochorus pruinina (frosted dromo tiger beetle¹). 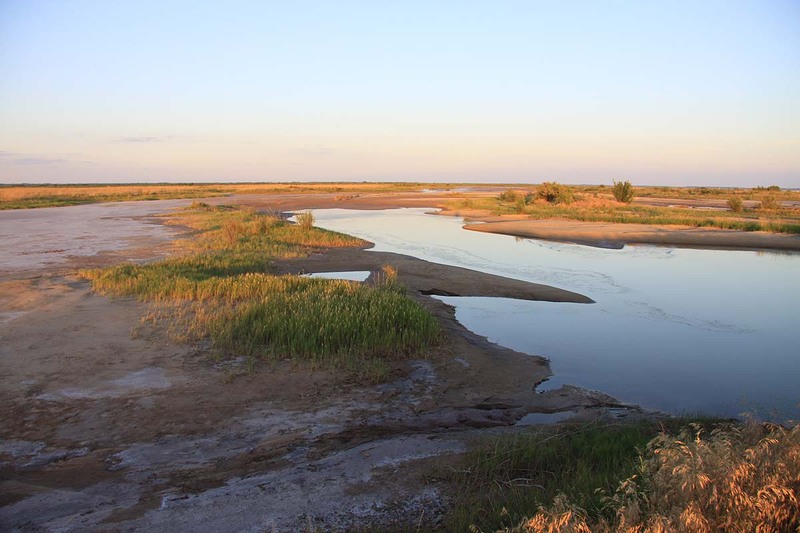 The next day was spent at nearby Salt Plains National Wildlife Refuge, just east of the red clay hills in Alfalfa Co. Salt Plains is best known for its Selenite Crystal Dig Area, where an estimated 30,000 annual visitors dig for Oklahoma’s State Crystal with its unique hour glass-shaped inclusion (the only known site where these crystals are found). 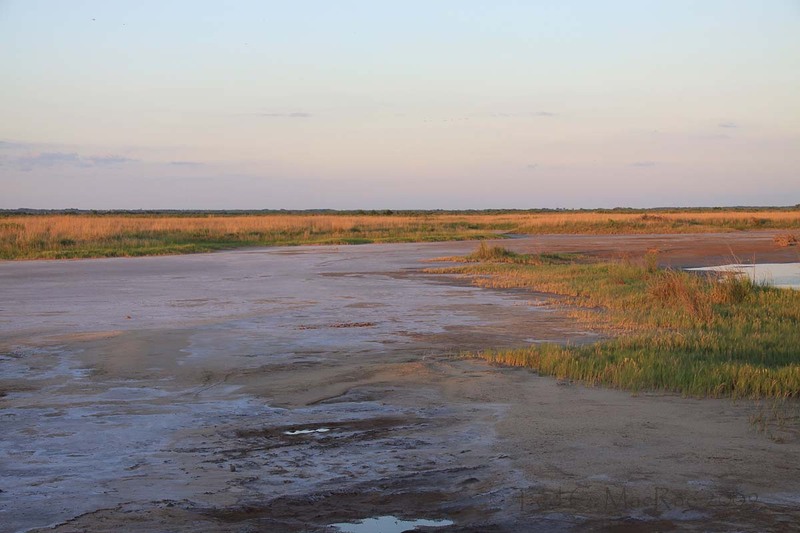 A dominant feature of the refuge, however, is its 10,000 acre saline flat – left behind by the vast Permian seas that once covered the interior of the continent and the largest such salt flat in the Great Plains. It was this feature that drew my interest. ¹ Common names according to Erwin and Pearson (2008). I first visited Salt Plains a few years ago when fieldmate Chris Brown and I were near the end of a rather unproductive (yet still enjoyable) fall tiger beetle trip to the nearby Gypsum Hills of south-central Kansas (Cicindela pulchra had eluded us – for the time being!). We noted the refuge on the map and decided to take a look – becoming instantly enamoured with the diversity of tiger beetles seen running on its barren, salt-encrusted mud flats. I returned the following fall with long-time fieldmate Rich Thoma and Hardtner, KS resident “Beetle Bill” Smith, who introduced us to the refuge biologist so we could get permits to do some proper collecting. Most of the tiger beetles we saw were widespread and familiar to me – Cicindela species proper such as C. formosa formosa (big sand tiger beetle), C. tranquebarica (oblique-lined tiger beetle), C. punctulata (punctured tiger beetle), and C. repanda (bronzed tiger beetle), but it was the creamy white Eunota togata globicollis (alkali tiger beetle) that had me swiping my net for the next hour or two. Sadly, those were in my pre-photographer days, so I have no visual record of that species other than the pinned specimens in my collection. My visit during this trip was completely unplanned. After the mid-week’s thunderstorms chased me back to this part of the state, I thought this would be a nice contrast to the red clay/gypsum hills where I saw C. celeripes and D. pruinina. In addition, the selection of tiger beetles active on the saline flats during this summer trip would likely be quite different from the fall/spring species I had seen on my previous two visits. Trouble was, the unplanned nature of the visit also meant that I didn’t have a permit, but I was prepared to limit my activities to only photography in case I was unable to convince the refuge staff to renew my prior permit. That eventuality was unnecessary, however, as the refuge biologist located my permit in a gray, dusty file cabinet and graciously typed up a new permit for me – good until next summer! With that, I was off to SandPiper Trail and seven hours of stalking, netting, and photographing. Some familiar faces were there again – C. formosa, C. repanda, C. punctulata, and C. tranquebarica (as they are almost everywhere), but I also encountered three beautiful species that I had not seen there before (one of which I had never seen previously). Like E. togata, each of these species is an alkaline habitat specialist that makes its living only in these harsh, saline environments. They were not the easiest species to photograph, easily alarmed in the heat of the day, but the vast open spaces allowed me to follow their escape flights with relative ease, and one-by-one they gradually became accustomed to my presence and eventually allowed me to get at least one or two good shots. Along with E. togata globicollis, these species bring the total number of species that I’ve observed at Salt Plains to eight – quite a hyperdiversity given the very small portion of the refuge that I’ve explored during my three visits. Willis (1967) has observed as many as 11 species in a single habitat, and while this may seem to violate the principle of competitive exclusion (limiting the number of species that can occupy a given niche), careful observation reveals small but distinct partitionings of this harsh environment by the different species. For example, C. fulgida was seen in the drier, more vegetated fringes around the flats, E. nevadica knausii was observed in moist, open areas near the water’s edge, and H. circumpicta johnsonii was more generally free ranging across the open salt surfaces. Temporal separation combines with spatial separation to further subdivide the habitat – the latter two species occur as adults during summer, while E. togata globicollis and C. fulgida adult occurrence is primarily during spring and fall (the individual I saw was likely a stragler). I have noted the same phenomenon with species occurring in clay habitats here in Missouri, with as many as six species seen at a single highway intersection in the White River Hills a few years ago. Landscapes: Canon 17-85mm zoom lens on Canon EOS 50D (landscape mode), ISO 100, 1/50-60 sec, f/7.1-6.3, natural light. Beetles: Canon 100mm macro lens on Canon EOS 50D (manual mode), ISO 100, 1/250 sec, f/14, MT-24EX flash 1/4 power w/ diffuser caps. Willis, H. L. 1967. 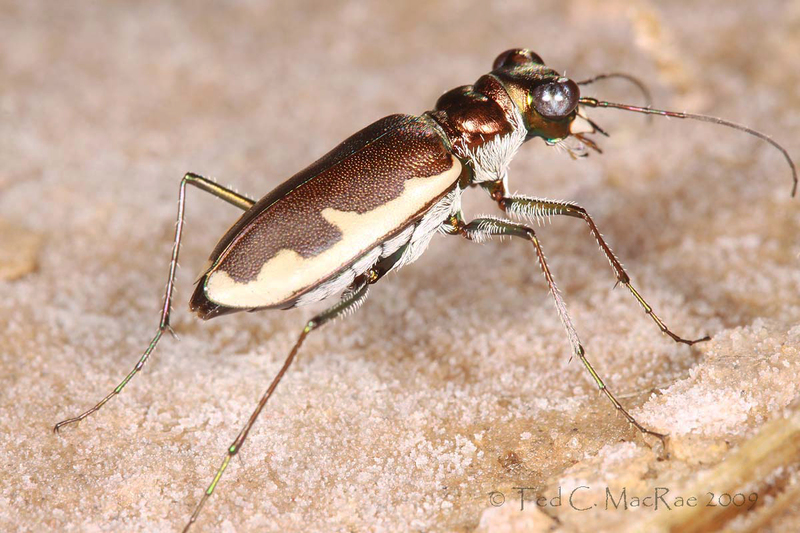 Bionomics and zoogeography of tiger beetles of saline habitats in the central United States (Coleoptera: Cicindelidae). The University of Kansas Science Bulletin 47(5):145-313. 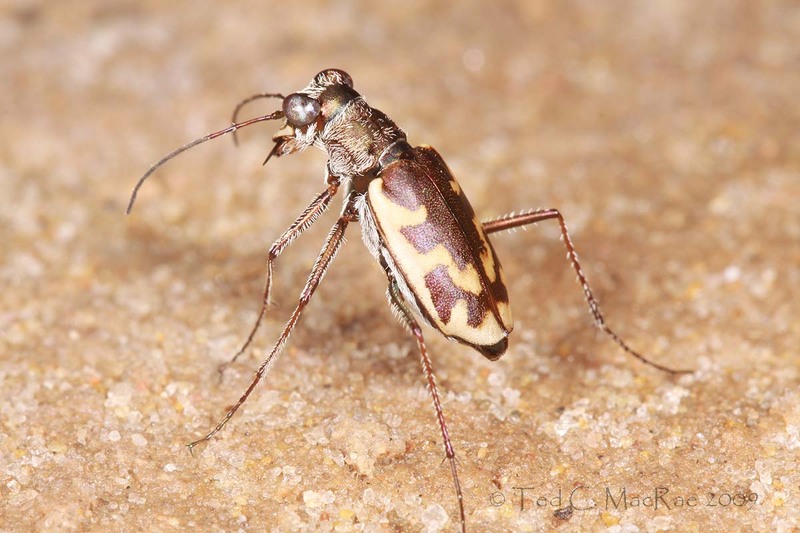 This entry was posted in Cicindelidae, Coleoptera and tagged beetles, entomology, Great Plains, insects, landscapes, nature, Oklahoma, salt flats, science, tiger beetles. Bookmark the permalink. What are the food items of these beetles on these salt flats I wonder? What about their larvae? Hi Trevor. Thanks again for your always kind comments. The adults scour the ground looking for anything they can catch, while the larvae wait in their burrows for something to wander close enough for them to lunge out and grab it. It’s gotta be a hard life – there aren’t many insects/invertebrates crawling around on those salf flats, and with the high densities sometimes seen with the tiger beetles (both larvae and adults) it doesn’t seem possible that they could get enough to eat. Somehow they manage! Are there any small saltwater fish in those lakes? It would be interesting to know if the US tiger beetles feed on any type of fish!? Are there associated freshwater areas as well? I have seen Australian tiger beetles feeding on large tadpoles trapped in rapidly evaporating small pools. I need to write these observations up soon, as I have only observed it once. Tiger beetles would probably eat all kinds of animal matter, including dead animals, eggs of other invertebrates, tadpoles, small fish etc. but as usual, it seems that specific observations are mostly lacking for any species. Are the burrows of the US species situated in the salt water? Do the tiger beetles eat each other? Their feeding and breeding behavior would be of great interest, I think! Willis (see references) had an extensive listing and discussion of tiger beetle prey species – both in the field and in captivity. The list contains invertebrates exclusively, with the exception of freshly dead carcasses (fish, rabbits, etc.). Willis speculated that perhaps the beetles were actually eating carcass-feeding insects, but I think it is feasible given the competition for resources and the fact that adults in captivity readily feed on hamburger and moistened dog food. I suppose its possible that they would feed on stranded fish and tadpoles, but probably it is not a routine food source. Shore flies seem to be the most common insect associate on the salt flats – I suspect they might be most commonly preyed upon by the beetles in these habitats. I have seen cannibalism in my captive colonies if there are too many in a cage and by larvae capturing adults in the same container. Enjoyed reading about the OK trip. Brings back great memories as I got my Ph.D. at OSU in Stillwater and while there we travelled extensively throughout the Sooner state! Loved your photographs also! They are wonderful to show your subjects closeup! Hi Henry, thanks for stopping by, and I appreciate your kind comments. I have a newfound appreciation for Oklahoma (and the Great Plains in general) with my trips there during the past several years. It’s a fascinating natural history that doesn’t get enough attention. That the tiger beetles like hamburgers and dog food means that they must have been very hungry! Was the hamburger meat cooked by any chance? Raw hamburger is better than cooked, but dog food is the most convenient and is used routinely for keeping adults in captivity if small prey is not readily available. I work in an entomology lab where we rear lots of insects for our studies, so live prey is always available (and makes feeding time fun to watch!). Yikes, I just checked out the prices on your camera equipment….That’s about like a nice bike! Is it all about the camera (and lenses)? If so, I guess that’s not so bad. If you actually have to have skill, I’ll give up now (and buy another bike). Great pic’s throughout! Hi sherkat. It’s funny you should draw the bike analogy, because I got the setup by selling off a bike build, racing wheels, aerobars, TT helmet, etc. (and I got some pretty good deals on some of the items). To a large degree, it really is all about the camera/lens! It takes just a little bit of smarts to figure out how to get going (and I’ve been lucky to have a personal coach), but the equipment takes over and has you taking great photos from the start. Talent and experience gradually move you into the realm of fantastic photographs that somebody is actually willing to pay for – I’m not there yet, but thanks for the nice words. 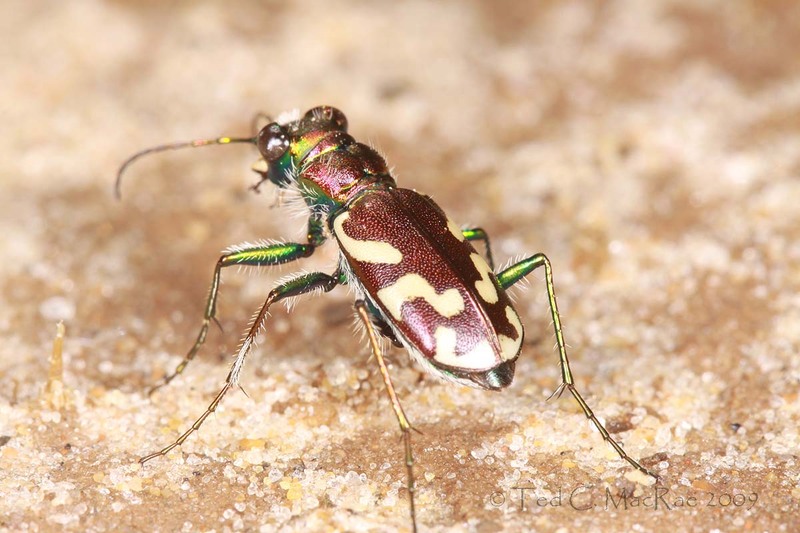 The pictures associated with this post helped me identify one of my beetle pictures as that of a tiger beetle. Not sure of the species, but just knowing it’s a tiger is enough for now. Here is the post. Hi Doug – glad to help. I left a comment on your post with an ID of the species.